Unlike every other race, I wasn’t particularly nervous before the event. But I still woke early and made sure I had plenty to eat and drink before I started my final race preparations. I met Bouch, Naomi Gabby and Lewinski in the hotel foyer and we set off for an easy warm up. We jogged across the bridge and joined the thick flow of runners making their way into the race precinct. I chafed with impatience as the press of people slowed on our way in. I considered pretending I was a European au pair to see if I could get through quicker, but before I could google Peter Dutton’s number, the narrow section spilled out into a much wider expanse and we were free to move quickly once more. We met up with the rest of the team near the start line. It feels great being part of a team (unless you are Julie Bishop or apparently any other woman in the Liberal Party) as you get that extra buzz from the support and excitement your teammates show towards you. We exchanged last minute good luck words and hugs and in no time the race began. The course snaked back on itself twice when we reached the southern side, giving plenty of opportunities to wave at friends at different points in the race, before spiralling down and under the highway, coming out heading east along the expressway past Circular Quay before turning up Macquarie Street and approaching the first drinks station. It wasn't even 7:30 but the sun was out shining gloriously and, contrary to the forecast cold, it was pleasantly warm. We swept through Hyde Park. The temporary bridge shook beneath our feet as crossed above William Street and passed the War Memorial on our way to Oxford Street. Whilst Lewinsky and I were still running with the pace group, we had let ourselves drift just in front of the congestion of the main group, whilst still using them to regulate our pace. This did mean we had a little less protection from the wind, but at least we could turn corners without running wide or risking tripping on other runners - and on a course that turns 180 more often than Coles' plastic bag policy, that seemed a good deal to me. It just meant I would have to make the most of it by working every corner as effectively as Julia Roberts in Pretty Woman and draft off other runners wherever I got the chance. I often really struggle to get through my energy bar so I ate it earlier while I was feeling really good- it did take me 4km to finish it but that might have been because I was talking the whole way. “How are we nearly ten kilometres already?” I remember asking myself. I really was talking a lot though. Occasionally nearby runners would turn and look in my direction, no doubt wondering if I was ever going to shut up. I smiled apologetically (I have the same thoughts towards Tony “no undermining” Abbott) but just kept talking. Lewinsky and I continued chatting and we started up a conversation with another guy called Chris who I had been shamelessly using as a windbreak for the last two kilometres. The three of us ran together with barely a pause in our conversation for a number of kilometres as we rolled on down towards Centennial Park. ​The park itself was beautiful- kilometres after kilometre of gently sloping and winding paths that were mostly shaded by the magnificent greenery on either side. We made our way through a few detours and turnaround points before eventually turning back to head for the exit, passing a stream of runners coming the other way and taking the chance to exchange cheers with anyone we knew. Breaking away from a larger body can often be difficult and come at a cost (just ask the government of Ukraine) so we had been pretty happy to keep the 3 hour pace group close in our rear view mirror, but as we came out of Centennial Park, the pace group dropped further and further behind us without us really noticing. Our conversation with Chris eventually came to an end as he got faster and faster, until we had to let him run ahead, but the two of us cruised together back down Oxford Street (I’m told we weren’t the first pair of lycra-clad blokes to cruise down Oxford Street either) and into Hyde Park. ​As we approached the War Memorial for the second time, we got a big shout out (and a little bum-wiggle dance that Michelle Jenneke would be proud of) from Kaylee, while Elaine, Will and my wife and daughter were all waiting just beyond. I felt a surge of happiness and adrenaline, and zigzagged across the track to high five people and be close to my little girl. Jarrod had been slowly catching up to us for the last few kilometres and he joined us as we passed the fountain. The course cut its way down through The Rocks, avoiding the steepest descents and coming out to see the blue water of the harbour blazing gloriously in the sunshine. 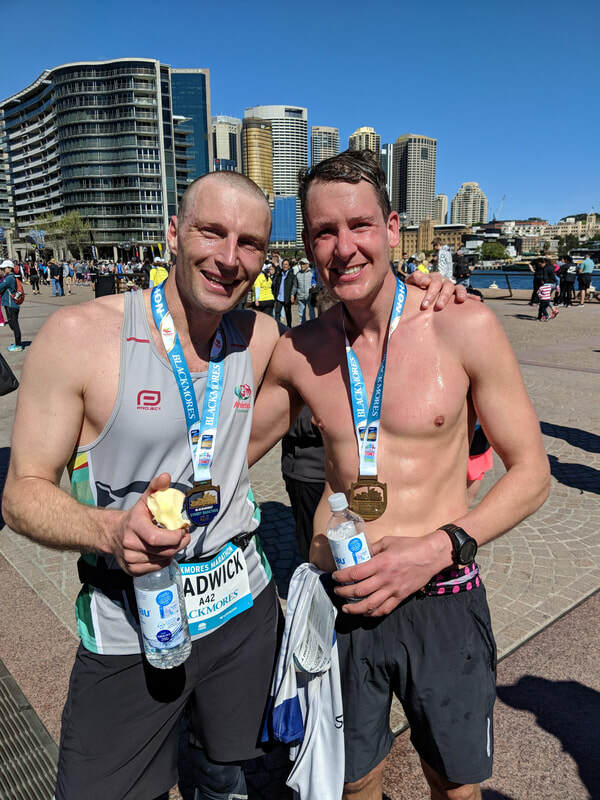 The three of us continued to chat cheerfully as we ran under the Harbour Bridge, which is a seriously impressive bit of infrastructure seen from up close. Lewinsky’s legs were starting to get tired (apparently Lewinskys aren’t used to being on their feet for long periods) and Jarrod was also a little concerned that he might have pushed a little hard early. Much as I was enjoying the company, it soon became time to heed to words of Fleetwood Mac. ​I didn’t exactly speed up, but I didn’t drop my pace either and the runners around me seemed to be losing a fraction of pace. Suddenly I was overtaking people regularly as we made our way past Darling Harbour and through the twisting streets of Pyrmont. Even with the twists and turns and the strengthening wind, I was really enjoying this section of race. Usually at this time I am starting to weaken and struggle to hold my pace. In my most recent effort at Gold Coast, I was practically ready to stop at 32km, but this time round I felt really good. Although I felt strong, I reluctantly opened a gel at around 30km. I knew the energy boost would be important, but I find the syrupy texture of gels makes them harder to swallow than the fact that over a third of Australians still believe the Coalition is worthy of their primary vote. I turned around the furthest bollard and headed for home, still with a spring in my step. The feeling of invincibility never lasts right to the end of a race though. At around 36km, the constant turns and undulations were beginning to take their toll. I felt like I was still holding the same pace, but it was taking more effort to do so and I had little left for a final surge to the line. It got harder and harder over the next couple of kilometres. The expansive view of the sparkling harbour to our left was breathtaking (not that I had much breath to spare at this point), but it was also quite a lonely section, with little support from spectators; and the field had separated so much that there was often barely another runner in sight. I was overtaken a few kilometres from the end. Much as it seemed to a good time to show some solidarity with Harper Nielson (who, jokes aside, I believe is very brave and far more impressive than the retrograde bullies who attacked her, without feeling any embarrassment that they usually paint themselves as championing freedom of speech) by sitting down in the middle of the track, I forced myself to tuck in behind the guy that just passed me and keep pace with him. Despite sluggish legs, I stuck to my task grimly as we wound our way into and around Circular Quay. At last the final chute to the Oprah House opened up and I managed a modest (love to say this was to match my personality, but it was just all I could manage with my fatigue) final surge and motored thankfully over the line. With the thousands of runners and spectators around, you might have thought that finding friends after the race would be like finding a needle in a haystack, but it turned out to be easier than I thought (more like finding a needle in a strawberry) as Kaylee and Elaine were waiting for me just over the line. The rest of the crew were nearby and I walked thankfully over to embrace my family. Holding my baby girl at the finish line after running a PB was a pristine moment for me and one I will remember for a long time. It’s a good thing I have the memory too, as I was pretty quickly ushered away by volunteers and directed to the finishers’ area where I grabbed an apple and some water before heading back to watch the rest of my friends and teammates finish (click here for all results). It was a hard course, made harder by the windy conditions and in any race there will always be a mix of good news stories and tough luck, but I was proud of the efforts of all my friends, regardless of the distance or speed they ran. I was particularly happy for Lewinsky, who ran more than half the race with me and took a big chunk off his PB. Despite tiring legs, he almost hung on for his first sub-three hour marathon. In the end it was a case of close but no cigar (the opposite of what Lewinskys are historically used to hearing), but still something to be mightily proud of. 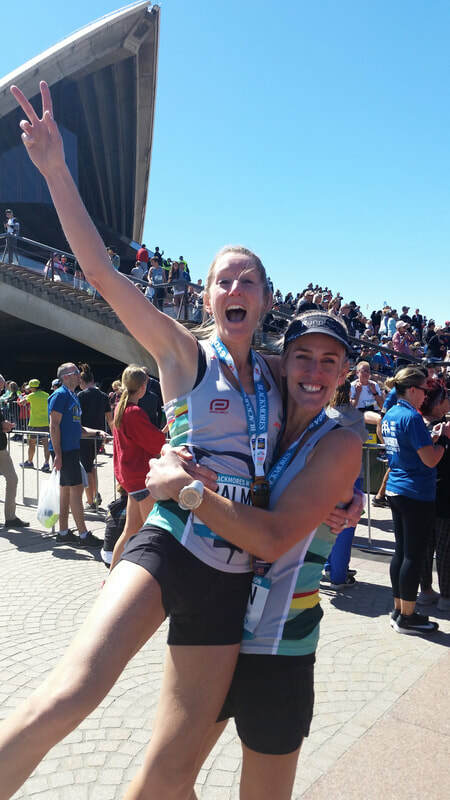 This was my second attempt at the Sydney Marathon. I certainly enjoyed the first time I ran it, but knowing the course and with better preparation, I had truly had an amazing day this time around. As always I am grateful to the organisers and volunteers who make it possible, as well as all of the people who trained with me and encouraged me, both on the day and in the lead up. You all made a difference. Thank you.